It is the last Friday in July, and we all know what that means…yes, it’s SysAdmin Day!! Lesson: Don’t mess with us SysAdmin’s!! But we fix the problem anyway. Everyday. Because that’s our job…and we love our job!! At least I do…I enjoy being a Network Engineer. I hope you are enjoying your job too!! And I hope someone at work today told you “Happy SysAdmin Day”, and thanked you for all of your hard work. This entry was posted in Network Engineer -- Career Talk on July 30, 2015 by sr71rocks. That is awesome! Happy SysAdmin Day!!! Man, I thought this was a joke when I read it. I’ve never even heard of Ted Kekatos until you brought this up. Yep…it’s real. 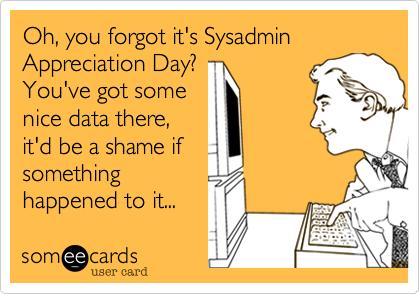 Of course, that doesn’t really mean much…it’s not like managers everywhere are wishing “Happy Sys Admin Day” to all of us IT folks.